These four Kurdish Syrian family members are traveling on foot. This group of brothers and a slightly older uncle left the town of Amuda located in the Kurdish region of Syria 10 days ago. As ISIS fighting was closing in to only 30kms from Amuda, they decided to leave. After making their way to the Turkish border and meeting their smuggler contact, they each had to pay 350 USD to cross the Turkish border on foot, under the cover of night. They made their way to the coastal city of Izmir from which they embarked on an inflatable boat for a perilous 15 minutes journey to Mitilini, Greece. They all had to pay 1200 USD each for this part of the trip. Upon arrival in Greece, they registered as EU refugees and then took a ferry to the Greek mainland where they then travelled by bus to Serbia. Less than one percent of the 14.4 million refugees around the world who are of concern to the United National High Commissioner for Refugees are submitted for resettlement to other countries. Hard decisions need to be made in all refugee populations as to who will be referred to other countries to start a new life. In making these decisions the UNHCR identifies those who are most the vulnerable and have specific needs which cannot be addressed in the country where they have sought protection. This often includes female-headed households, children, victims of torture, journalists, human rights defenders and members of the Lesbian Gay, Bisexual, Transgender or Intersex (LGBTI) community. 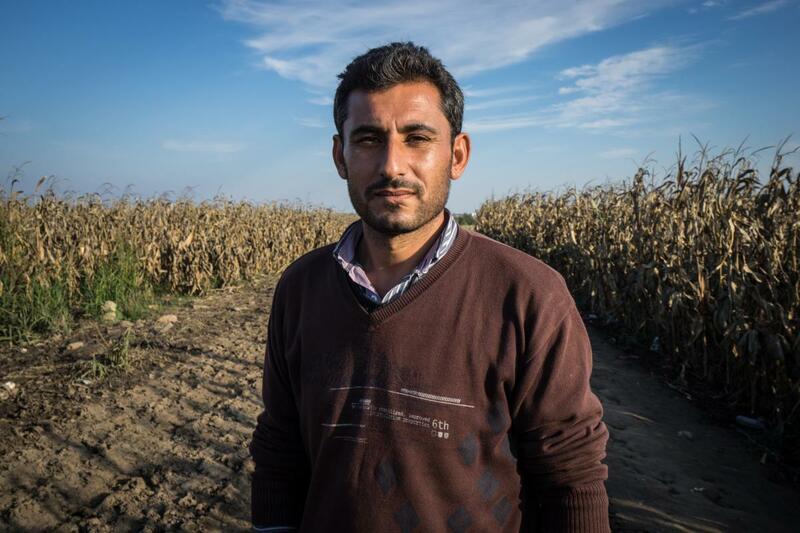 Ismail Al-Ahmad, a 31 years old archeology teacher from the city of Amuda, located in the Kurdish region of Rojava, Syria, poses for a portrait photograph in Šid, Serbia, Friday, Oct. 2, 2015. (Photo by Giles Clarke/Getty Images Reportage) Ismail (pictured) is part of group of four Kurdish Syrian family members traveling on foot. In selecting 25,000 Syrian refugees for resettlement to Canada, it is a mistake for the government to out rightly eliminate single men from the possibility of resettlement or only focus on single males who are members of the LGBTI community. Profiling single men unfortunately only serves to feed into negative sterotypes which already exist, and risks stigmatizing an entire population as individuals who are to be feared or who are gay. There are many single men apart from LGBTI individuals who may be vulnerable. For example, those with public profiles like journalists or human rights defenders are at risk. The government has set itself a huge challenge in its goal to resettle 25,000 Syrian refugees by the end of 2015. It is noble that exceptional resources are apparently being put in place in order to make this happen. In the process of resettling refugees it is critical that we do not discriminate against refugees according to their religion, ethnic background or gender. Refugee resettlement seeks to identify those who are the most vulnerable. Let’s not engage in decision-making that stigmatizes and discriminates in the process. These attitudes and resulting actions are the very reason so many refugees are forced to flee in the first place.